Do guests know that you share your Springs luxury apartment home with a pet as soon as they walk in the front door? Even the smallest and quietest pets often make their presence known with a distinctive animal scent. Getting rid of your precious pet is not an option, so focus on getting rid of the odors. Here are some expert tips for minimizing those funky pet smells. Thorough and frequent cleaning is the most obvious answer because it's also the most effective. Commit to regular vacuuming and make sure you include baseboards, furniture cushions and other areas where pet hair tends to accumulate. The hardwood-style floors in our Springs luxury apartment homes are easy to maintain. Just remember to sweep or mop softly to avoid circulating pet hair and other debris. It can be a full-time job just cleaning hair from upholstery and the nooks and crevices of furniture. No, this doesn't mean no more snuggling on the couch. Use a sheet, blanket or other removable protection that can be laundered. The longer pet urine and other “accidents” sit, the more deeply the smell penetrates into rugs and floors. Use paper towel to blot or pick up as much as possible, then use an enzyme-based cleaner that activates on contact to eliminate ammonia crystals and organic matter. If the stain has set, use a commercial carpet stain removal product. Avoid steam-cleaning, which can permanently set the stain, as well as strong-smelling chemicals such as ammonia and vinegar, which can encourage your pet to continue relieving himself in the area. Personal hygiene is just as important to your furry friend as it is to you. 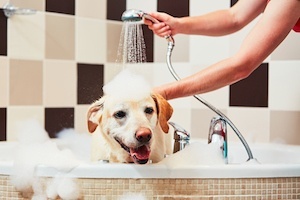 Use the convenient pet spas at our Springs communities to keep your dog clean and odor-free. When your apartment is closed up, it traps any odors and makes them more concentrated. Opening the windows allows fresh air to circulate and displace the smells. When it comes to pet odors, the litter box may be the biggest offender. Place the litter box in an area that's convenient for the cat but secluded enough for privacy. There's no getting around it: scoop the litter at least once a day. Cats have an extremely fine-tuned sense of smell, so scented kitty litter can actually be counterproductive and cause your cat to avoid the box. Stick with odor-free products or add a small amount of baking soda. Wash the tray each time you change the litter to keep waste and debris from sticking to the sides. An inadequate level of kitty litter will frustrate your cat by making it difficult for her to cover waste. Use at least three inches of litter and replenish when you scoop. The days are getting longer and warmer, so it's the perfect time to let your pet burn off that excess energy at our on-site off-leash dog parks!